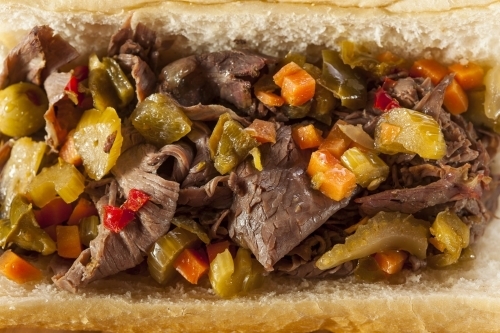 Chicago-Style Italian Beef Sandwiches have been around since the early 1900's. But it is said to have been popularized by a Southside Italian immigrant named Pasquale Scala, who was a butcher and sausage maker around the 1920's. Like many foods during this time, the Italian Beef Sandwich was created out of necessity. Thin shaved slices of roast beef placed on an Italian roll with sweet peppers was very economical in those days. Soon everyone was eating beef sandwiches. They would be served at weddings, funerals and political events all over Chicago. In those days the Italian Beef was made by slow roasting the beef in a pan of beef stock seasoned with herbs and spices. This created a flavorful juice which is necessary to produce the perfect sandwich. The meat was then sliced paper thin dipped in the juice and served sopping wet between fresh Italian dinner rolls. To complete the sandwich's delicious flavor you would top it off with sweet bell peppers and/or hot or mild giardiniera. Add more juice on top or dip the entire sandwich in the seasoned juice and you have created the perfect Chicago-Style Italian Beef Sandwich. In this day and age slow roasting can be achieved in a slow cooker or crock pot. This method of cooking will ensure that the seasoning and broth penetrates the meat to create a flavorful sandwich. You can also use the traditional method of roasting in the oven. 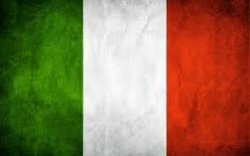 Great Chicago Italian Recipes.com has developed what we think is a perfect blend of herbs and spices so you can create a perfect Chicago-Style Italian Beef Sandwich in the comfort of your own home. Over the years it has been mentioned many times how people from different areas of the county miss the taste of a Chicago-Style Italian Beef Sandwich. So now here is your chance to recreate the same flavors you would only find at your favorite Chicago beef stand. Below you will find two methods of cooking. The first is the slow cooker method and the second is the traditional oven roasted method. Both are delicious so enjoy and don't forget the napkins. Make sure the roast is trimmed of fat. In a large frying pan brown the beef on all sides in the vegetable oil. Place the roast in a slow cooker or crock pot. Add the water, bouillon cubes, garlic. After 4 to 5 hours add the peppers and onions. Cook on low heat for 8 to 10 hours. Place a mound of shredded beef on the dinner roll. Spoon some juice over the top or dip the sandwich in the mixture. Top the sandwich with the peppers and onion. Top with Hot or mild giardiniera and your ready to eat. Heat a frying pan and brown the roast on all sides. Place the roast in a 9' x 13” baking dish. Add the water, bouillon cubes, garlic, peppers and onions to the pan. Cook uncovered for around 2 1/2 to 3 hours turning the meat once during that time. Remove the roast from the pan and reserve the juice. When the roast cools down, slice it thin with a meat slicer. Put the roast back into the pan with the juice and heat through.